Pipkin isn't the only cook in the kitchen; Corpsman Labbit Captain Holly knows a thing or two about serving up supper. During his recent refrigerator raid he noticed a beautiful head of broccoli and leftover bits of asparagus from Pipkin's Lentil Quinoa Asparagus salad. 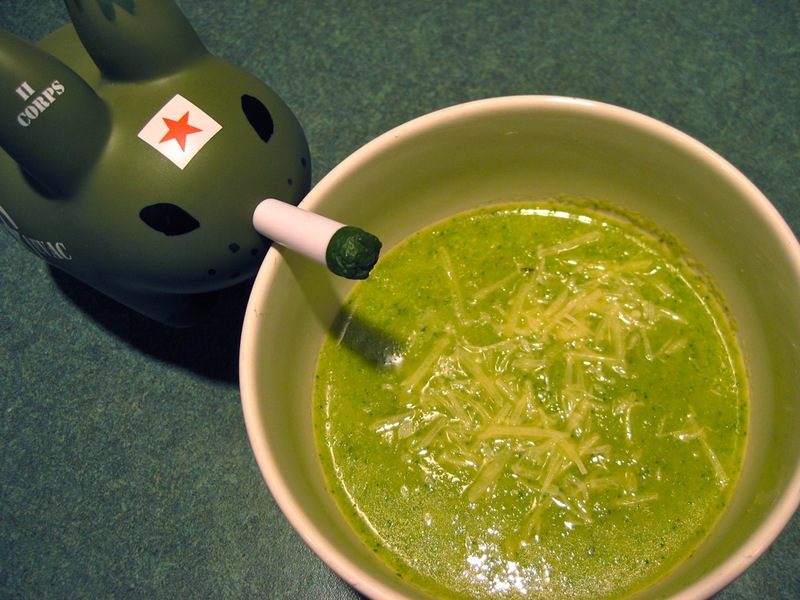 Not being a wasteful labbit, Captain Holly thought he'd throw together a broccoli and asparagus soup. He is quite fond of green, after all. Print the recipe here. 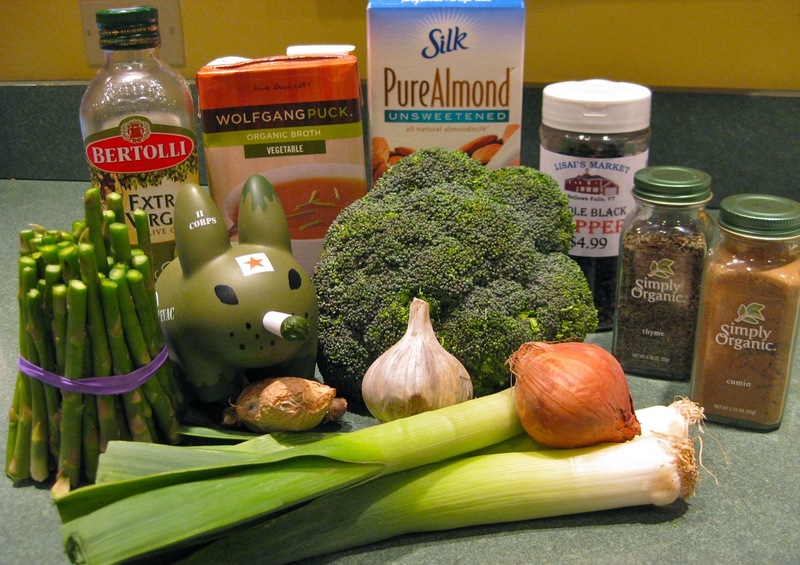 Bring broth to a boil and cook the broccoli, asparagus, shallots and leeks until the broccoli and asparagus are crisp-tender. Do not overcook! Broccoli will lose its flavour and bright green colour and asparagus turns into a soggy mush if overcooked. Remove from heat and allow to cool slightly. In small batches, puree until smooth in a food processor, and set aside. 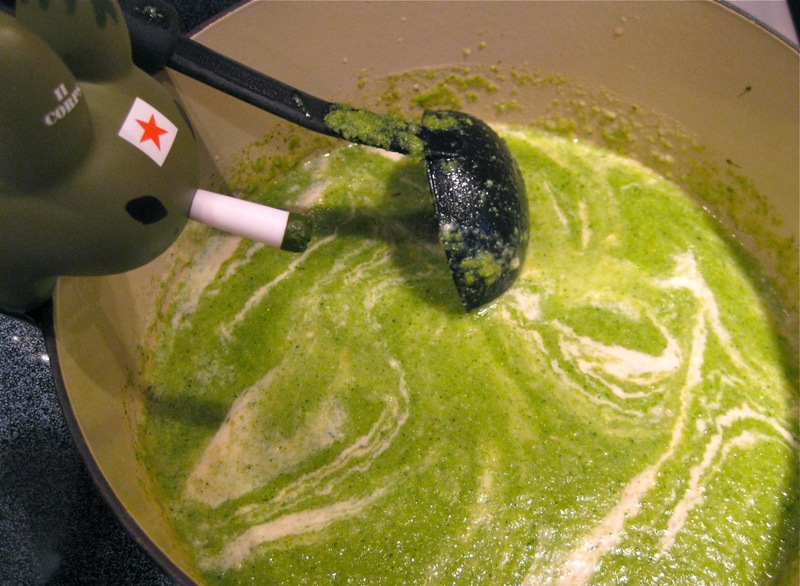 Heat EVOO or butter on low-medium heat and whisk in flour, whisking until flour is dissolved. Gradually stir in milk and continue whisking until smooth, about 2 minutes. Add garlic, ginger and spices, and swirl in heavy cream if desired. Add pureed soup, and stir. Cook an additional 10 minutes and serve warm, with parmesan cheese for garnish. If you have reserved asparagus tips, blanch by boiling asparagus in water for 2 minutes, then remove with a slotted spoon and immerse in a bowl of ice water. Blanching asparagus stops the cooking process, retains the green colour, and slightly tenderises the veggie, but keeps it nice and crunchy. This bitey texture is a nice contrast to the smooth soup. Captain Holly stirs in heavy cream. To quote Margery Williams, he likes his labbits "fat and bunchy, as a rabbit should be."